We can now provide more detailed information on the changes to lower value Machin definitives, first mentioned here. 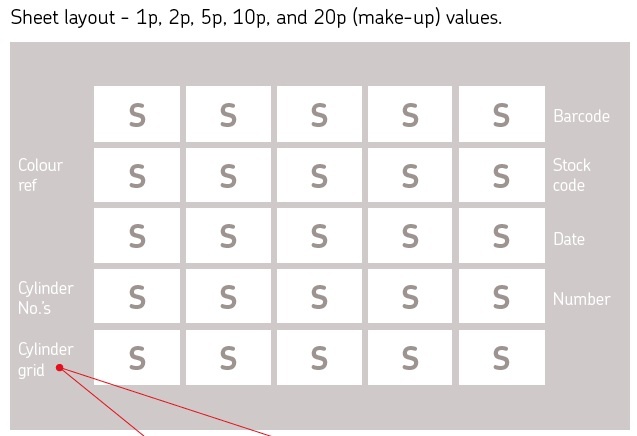 The self-adhesive 1p, 2p, 5p, 10p and 20p values will be printed in sheets of 25 and will incorporate the security slits but not the irridescent overprint. These will replace the current PVA gummed Machin Definitive sheet stamps of 200 for operational purposes as supplies are needed. * Peter S has contacted the Tallents House Bureau, and writes: "I have just spoken to the Philatelic Bureau and am reliably informed that the self adhesives will be will be supplied in accordance with the indivduals standing order requirements." But unless they change their normal procedures, there will be no FDCs; none are listed on the pre-order form. • The 1p and 10p will be printed on individual cylinders so each will be available in 12 cylinder grid positions. Although Post Office branches will be supplied with sheets of 25, it has been normal practice for philatelic counters and the bureau to be supplied with, and to supply, guttered sheets of 50. 68p & £1.10 for each country. Incidentally, on Machin Mania, Larry reports that in 1997 Royal Mail said that "self-adhesive stamps are designed for small businesses and would in no way replace traditional stamps". Times change!